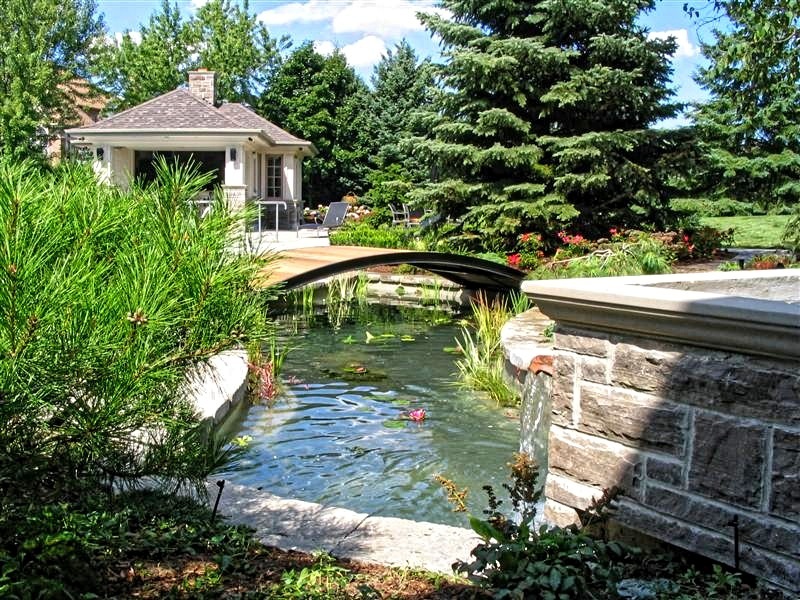 Constructed for ease of access and entertaining, and by balancing all elements of landscape design, the one-acre Golf Avenue is a beautiful kaleidoscope of colour, function and crafted engineering. 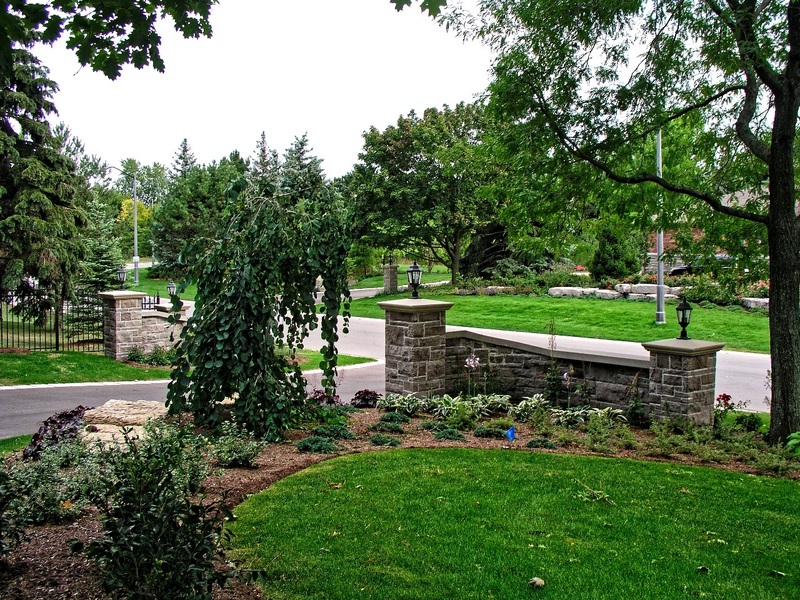 From the entrance, the lighted masonry entry wall mirrors the masonry block features of the existing home. 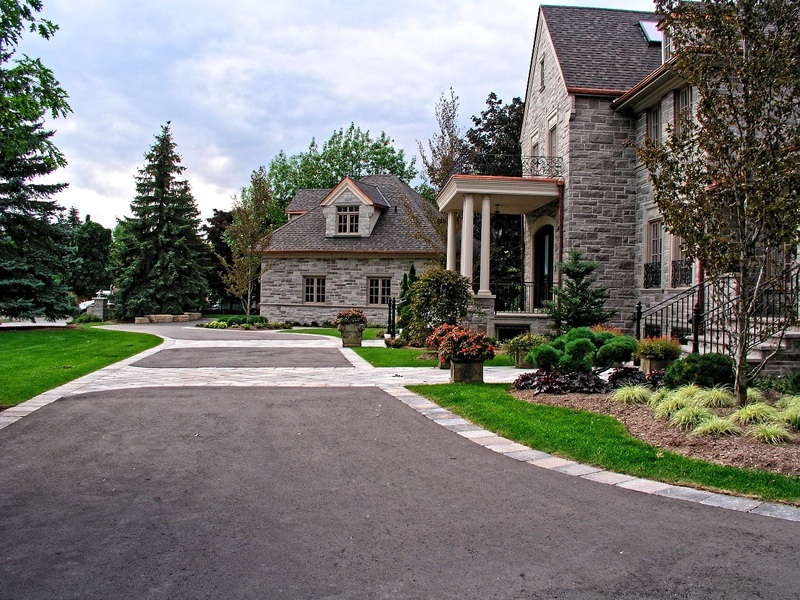 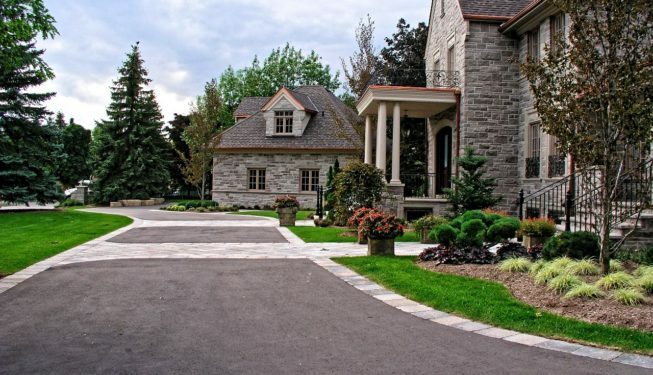 Guests drive onto a bordered asphalt driveway with flared ends that continues by a turnaround to the guesthouse. 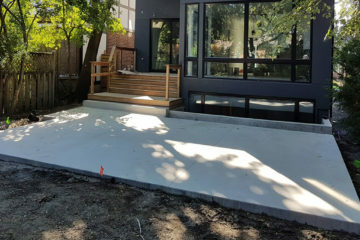 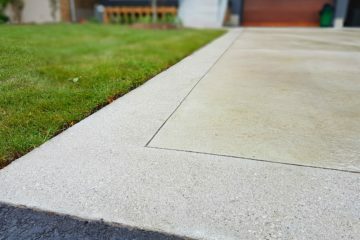 The driveway was engineered to divert excess rainwater all the way from the guesthouse to the front of the home with a calibrated minimal slope. 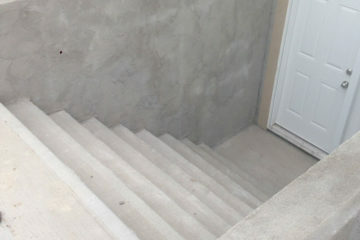 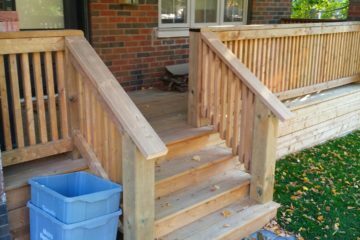 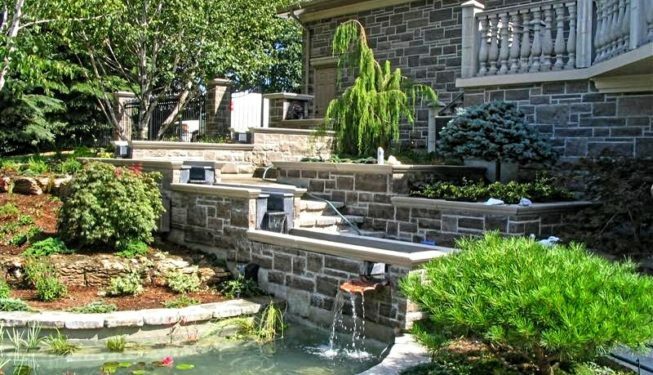 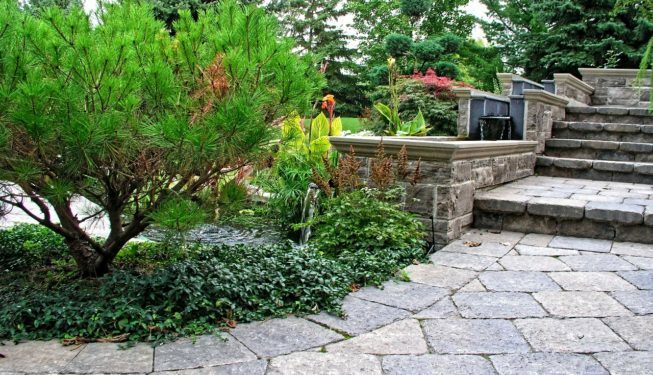 Patrons appreciate the wide and fully accessible natural stone walkways for ease of access and carry. 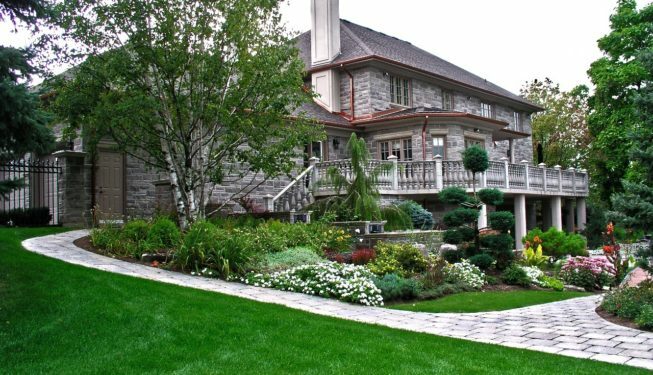 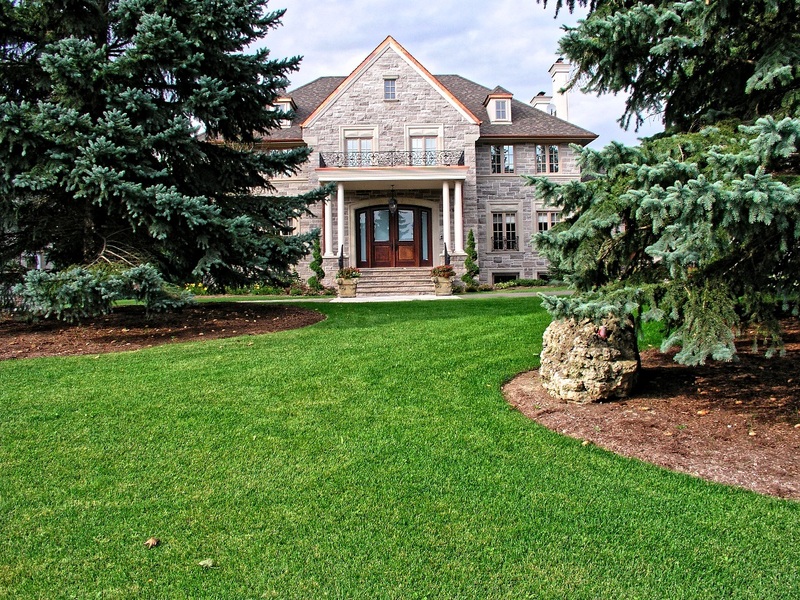 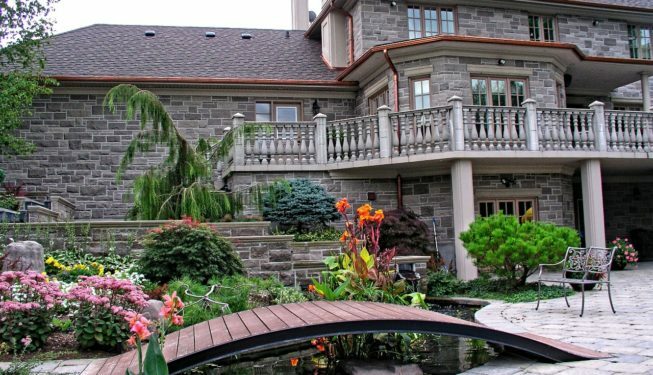 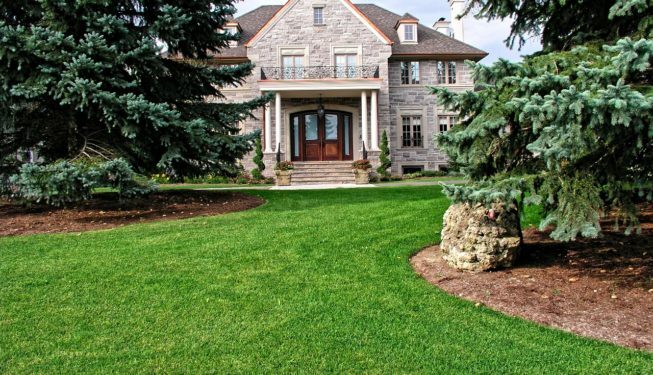 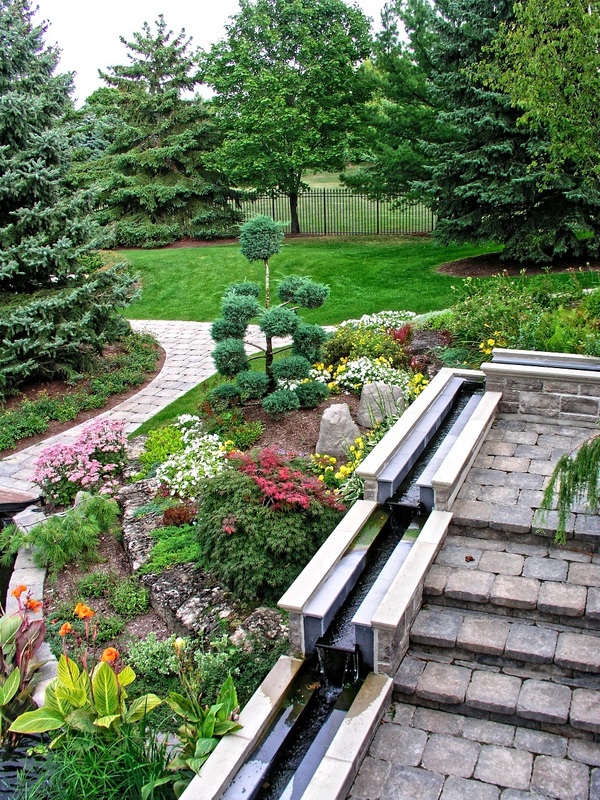 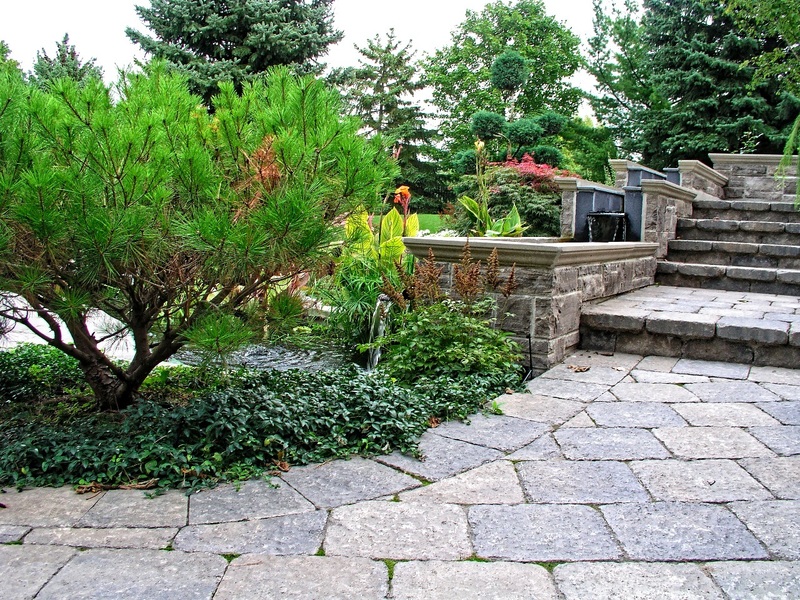 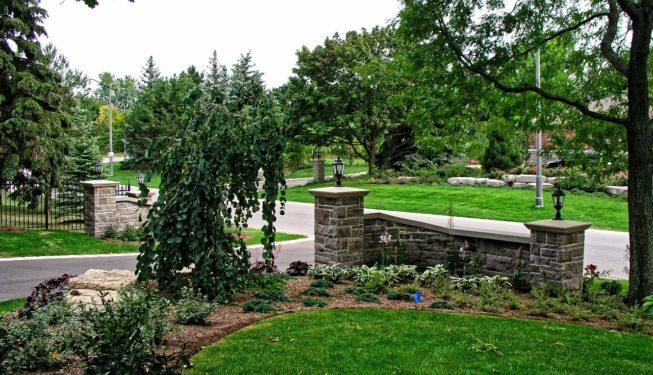 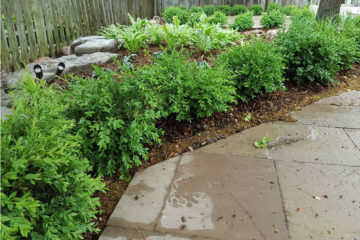 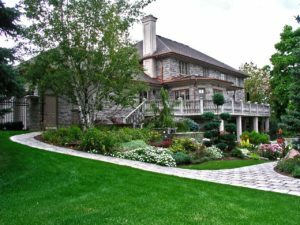 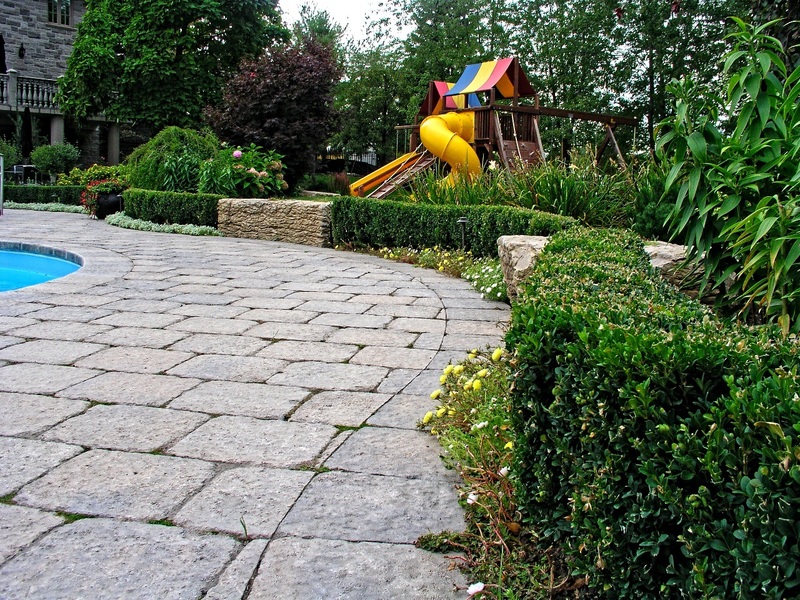 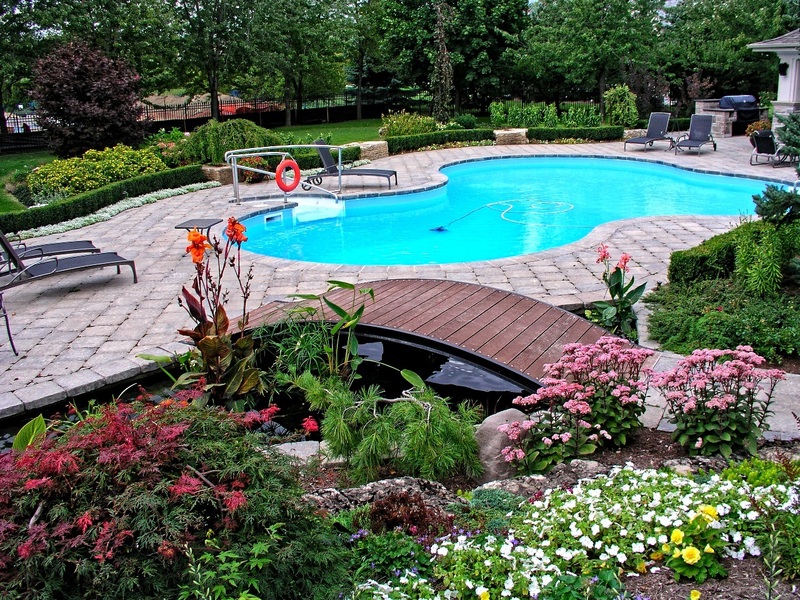 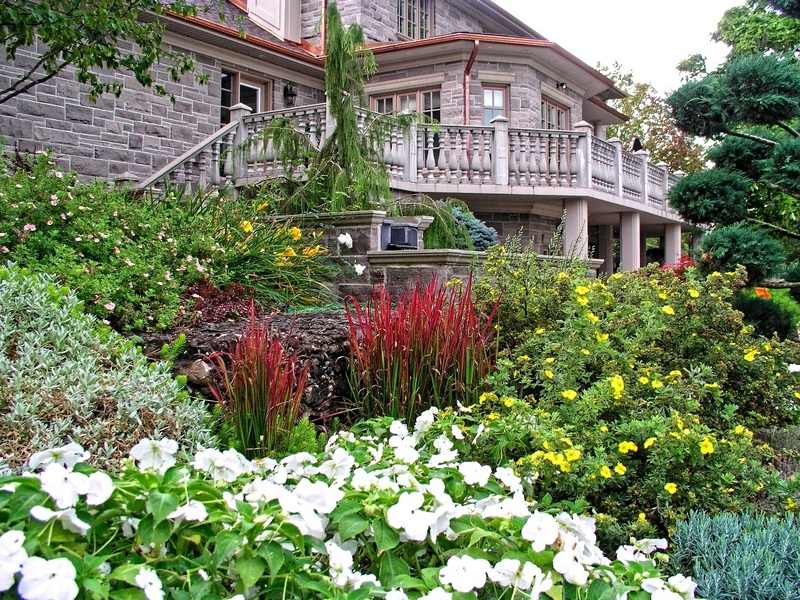 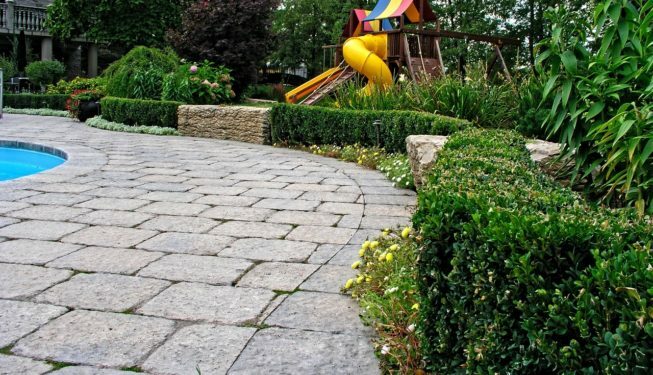 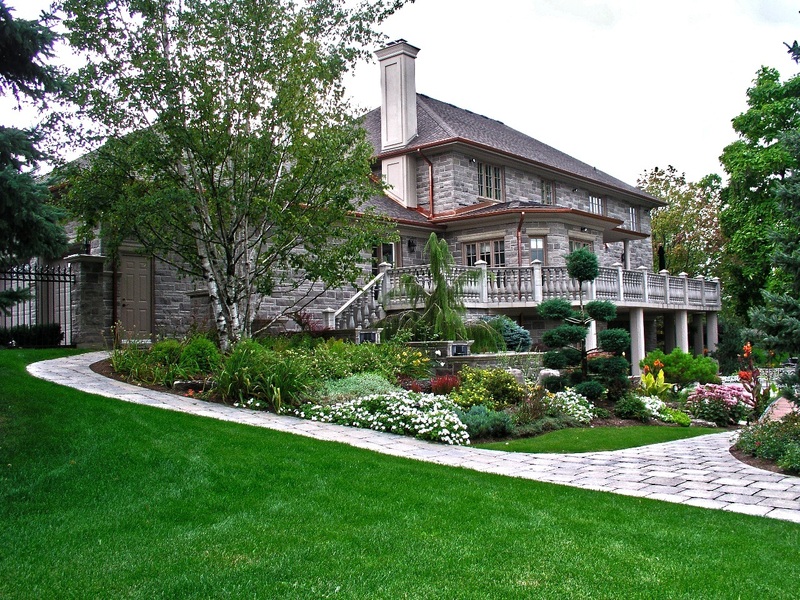 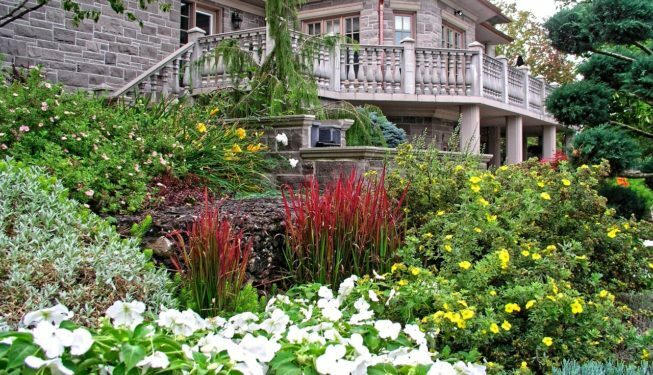 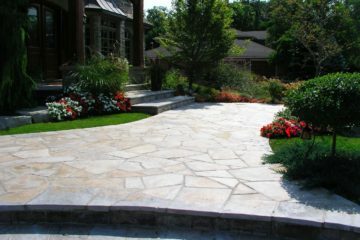 Rolling and free-flowing gardens comprised of rocks, trees, shrubs, grasses and perennials accentuate or harmonize entry points, walkways and landscape construction features. 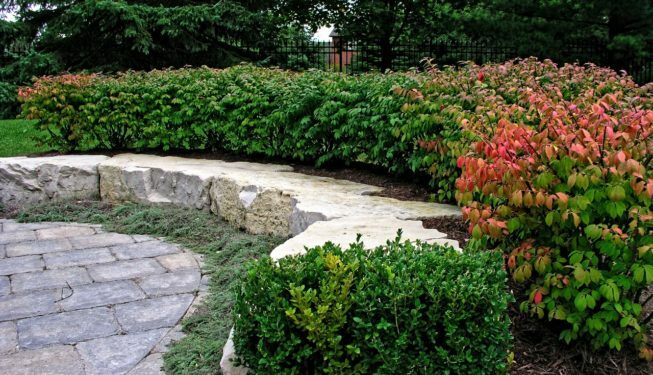 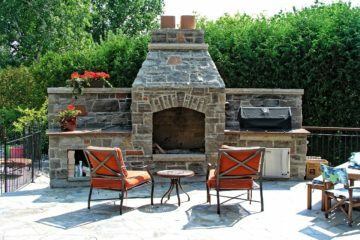 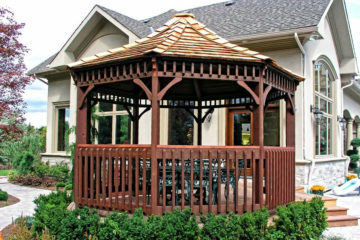 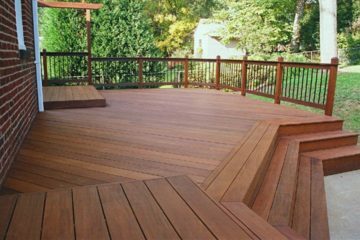 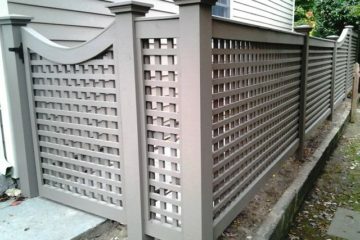 The planting of trees and shrubs also provide a natural privacy screen(s) based upon line-of-sight measurements and anticipated growth. 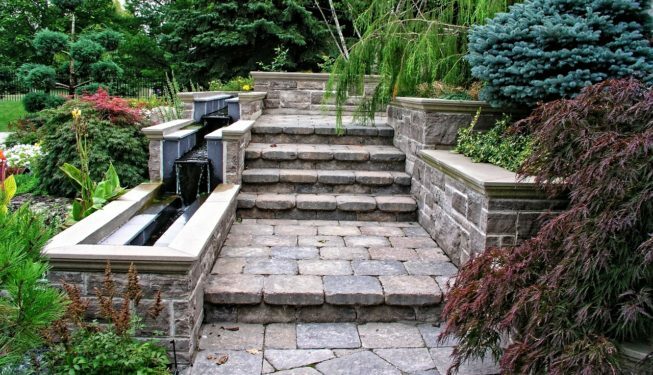 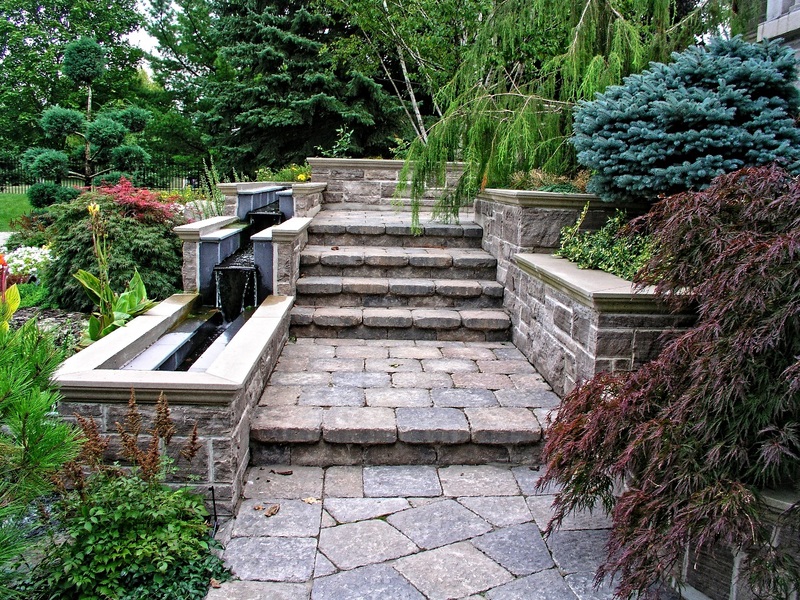 Moreover, the gardens and rockeries double as retaining wall steppes for erosion and run-off control within the layered design theme. 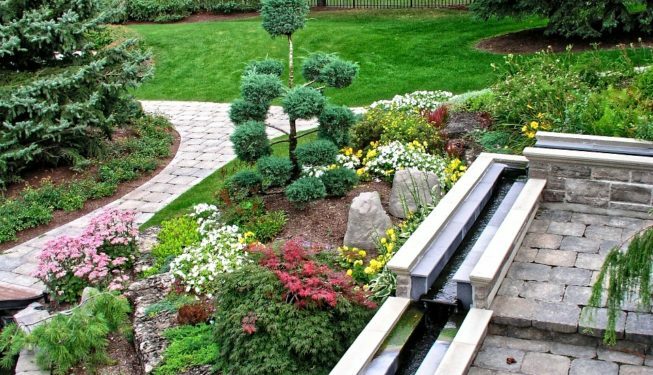 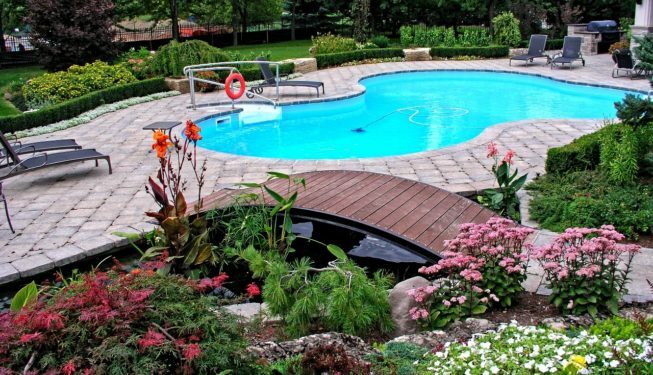 An integral theme is the creation of a habitable Koi Pond, surrounded by a perennial garden that masks the water filtration system. 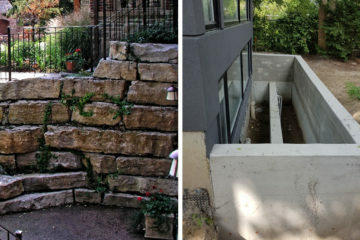 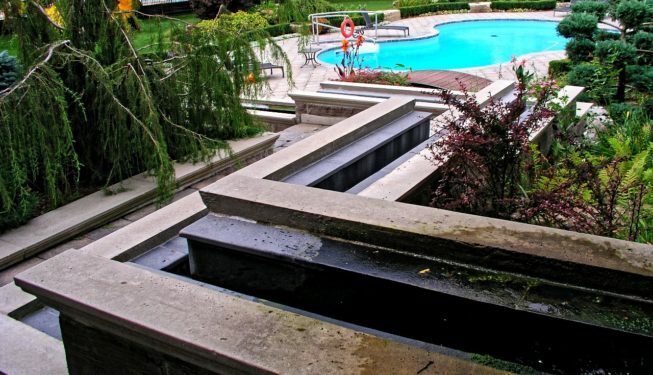 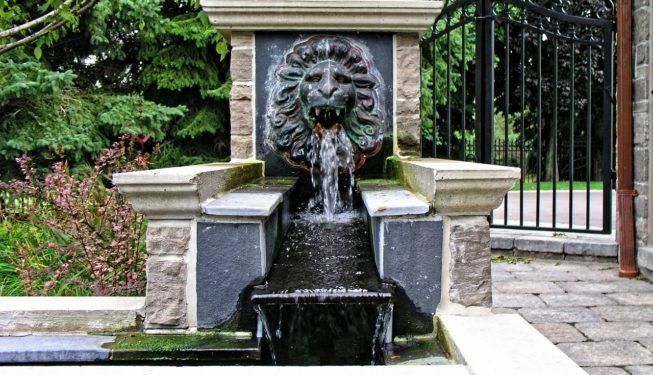 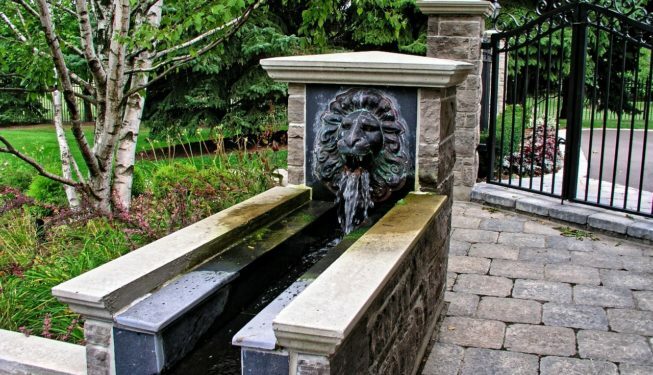 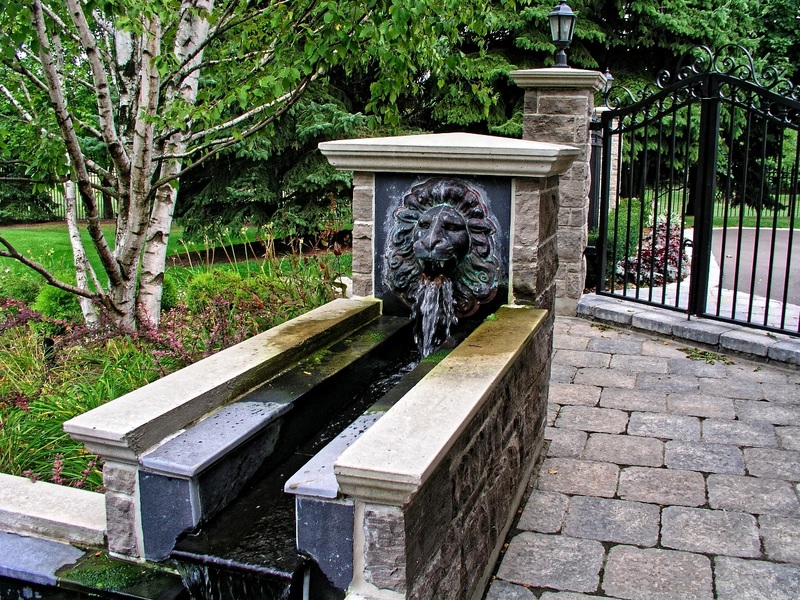 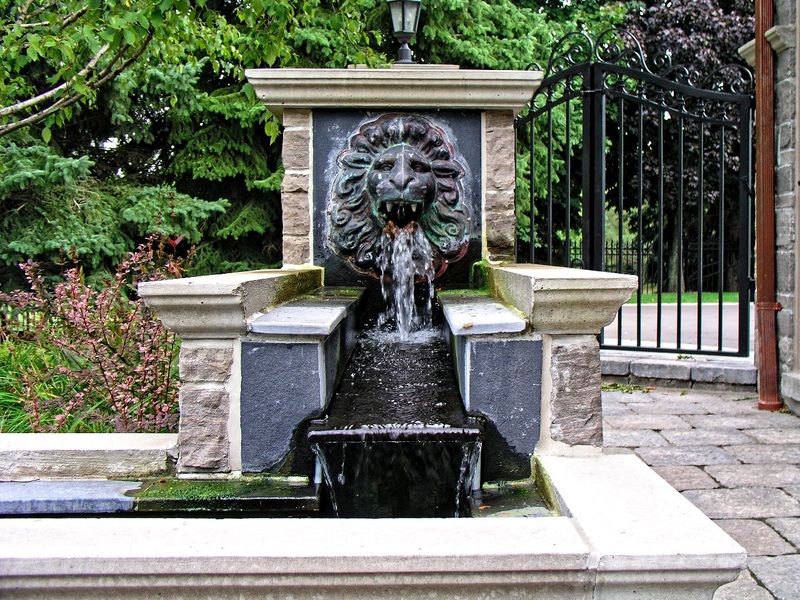 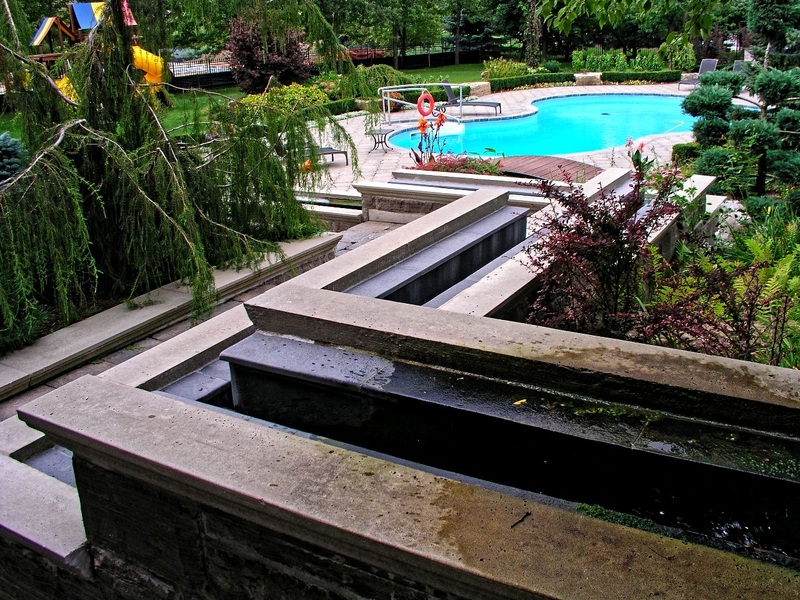 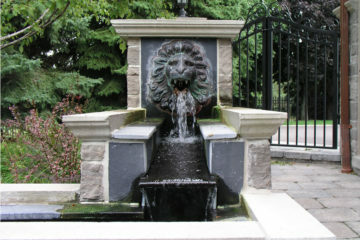 Water is fed through a custom-formed and reinforced concrete water trough and Lion’s Mask (from the renowned Heather & Little) customized as part of the Water Rill alongside an Open Leaf Rill. 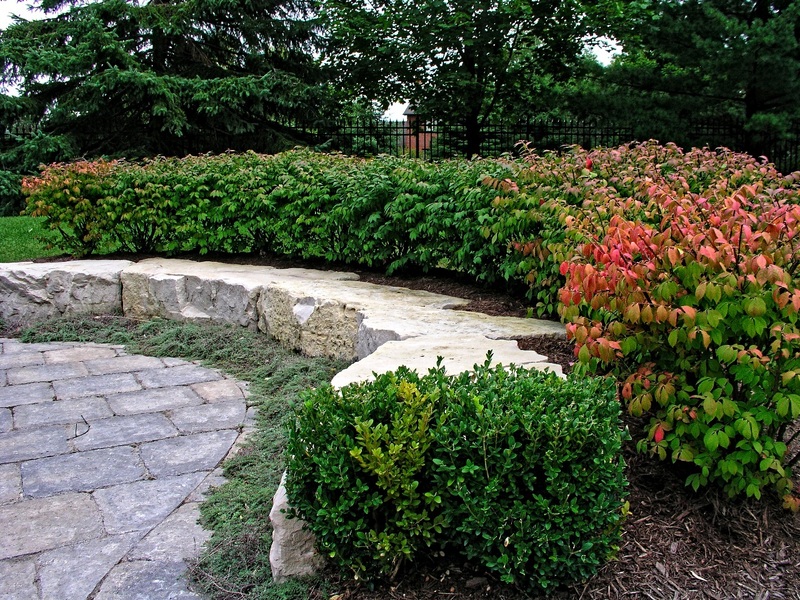 What’s interesting to note is that Pine Valley incorporated the trough theme from our award-winning London Rotary Reading Garden. 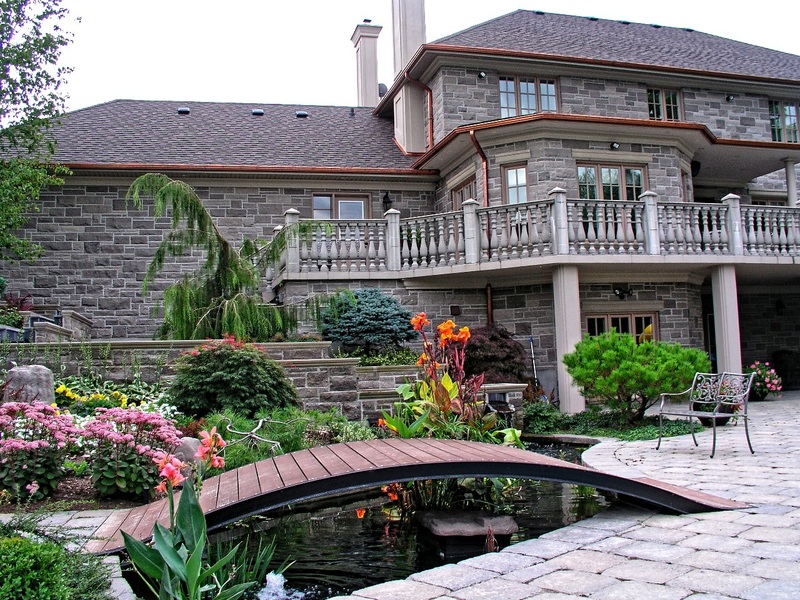 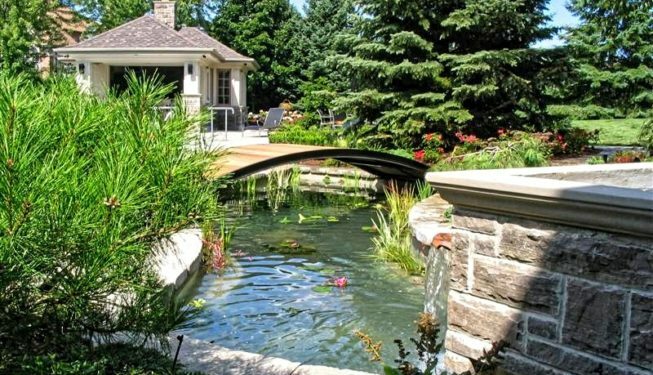 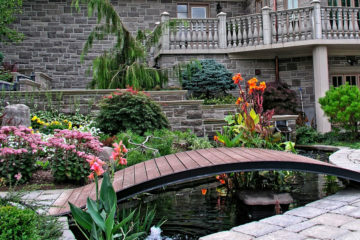 A custom metal and wood arched bridge spans the Koi pond. 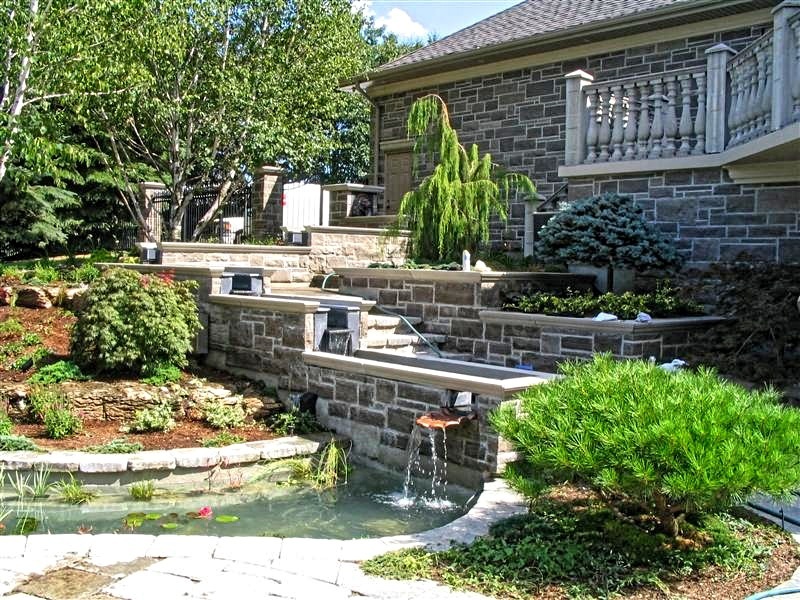 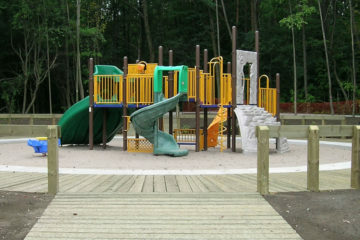 Other new construction features include: beveled natural stone walkways and step systems, armourstone retaining walls, swimming pool, playground structure, and Cabana complete with indoor kitchen, shower, washrooms and towel storage. 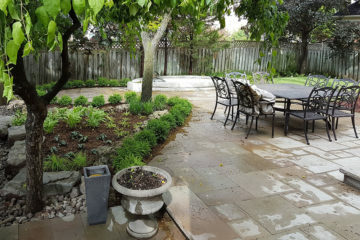 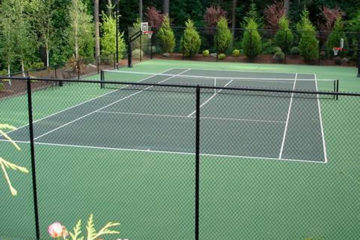 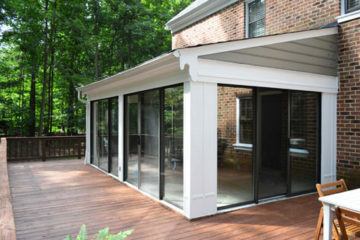 The property is irrigated and features low-voltage ambient lighting illuminating all thematic elements and walkways. 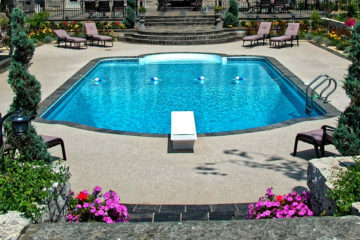 Please contact us for Site Visit and Tour availability.